Two men, two motorcycles, and 70,000 kilometers, (approximately 44,000 miles). 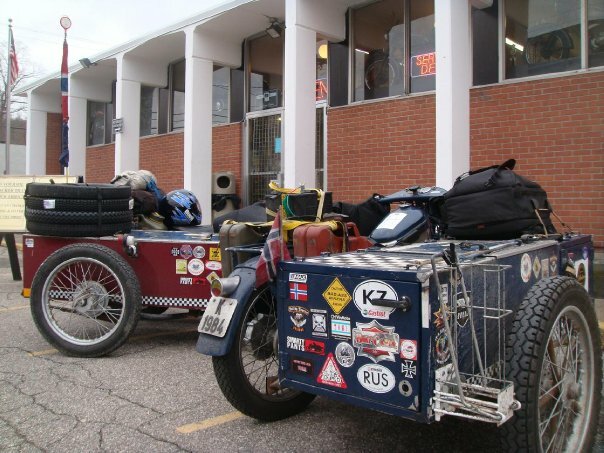 The KCCD2009 (King Croesus Contempt for Death) trip on two 1937 Danish Nimbus motorcycles with sidecars got its start in April, 2009 when two regular guys Tormod Amlien, 30, and Klaus Ulvestad, 43, of Norway quit their jobs and began the jo…urney. The ride started in Norway, and continued through Siberia, Alaska, and North America. The two plan to travel on through the United States and South America, where a boat will take them to South Africa. In South Africa they will travel through the continent up to Europe. But today Tormod Amlien and Klaus Ulvestad of Norway made their way to Doc’s Motorcycle Parts in Waterbury Ct.
Doc’s was glad to welcome them here, both where in great spirits and are very friendly guys who truly love motorcycling.